You’ve hit the Jack pot. 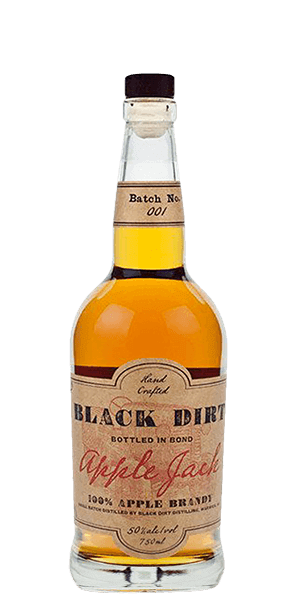 Black Dirt Distillery was founded in 2013 by Jason Grizzanti and Jeremy Kidde, but both Grizzanti and Kidde have been making Spirits with the Warwick Valley Winery and Distillery long before that. They know a thing or two about the business and their Spirits have been gaining a following and winning awards for more than a decade. Anyways, back to the name Black Dirt. The name refers to the region of dark, fertile soil in upstate New York where the distillery is located. Out there, the conditions for growing orchards that serve as base for distilling are just perfect. The new high-tech distillery is located in Pine Town and all the ingredients are sourced directly from the region. Local and organic, just the way we like it. Of course, ingredients and expertise mean nothing, if the two elements are not connected and realized in an actual product. Well, rest assured, Black Dirt Distillery Apple Jack does not disappoint. In fact, it blew us away with its modern take on a traditional US favorite. Apple Jack is the ultimate American Spirit, as American as apple pie. In fact, before the prohibition, the Black Dirt region was home to dozens of Apple Jack distilleries. The new rendition stays true to its roots and doesn’t take any shortcuts. This apple brandy is aged in oak for a minimum of four years and is “bottled-in-bond,” which means it is deliberately bottled at 50 %ABV as to ensure the purity of an American made Spirit. It packs a punch, that’s for sure, but it doesn’t overwhelm you with its potency. Clear, pure aromas of apple emerge. In fact, the sensation is similar to biting into a fresh honey crisp apple. So, how do you like them apples? What does Black Dirt Distillery Apple Jack taste like? The Flavor Spiral™ shows the most common flavors that you'll taste in Black Dirt Distillery Apple Jack and gives you a chance to have a taste of it before actually tasting it. This drink is one that adds a boom to anything it's added to. It's also absolutely perfect for just sipping on it's own. Quite a kick with each sip, it is a warm happy feeling going down and it tastes as strong as it smells. I regret not buying a second bottle as this turned to a staple. I didn't care for it. I think brandy just isnt my thing I have tried it several times and different types but dont care for any of them. wonderful drink over ice. very smooth brandy. Kind of like a cross between whiskey and apple cider, if you can imagine that. The cinnamon is a bit too strong and creates a real fire in your mouth, moreso than the alcohol does alone. Lightly tangy and just a little bit of apple notes. You can really taste that it is made from apples. Nice and strong. Overall it's a great drink.